The trochlear nerve, along with the abducens nerve, are perhaps the simplest of the cranial nerves in their function. Yet, the trochlear has a couple of unique properties and certainly some clinical correlates for the neurosurgeon. 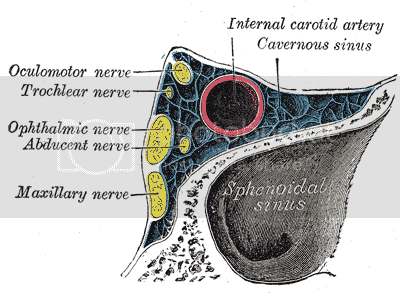 The nerve carries somatic efferent fibers which do but a single job, innervate the superior oblique muscle. The nucleus trochlear nerve is located near the midline, just inferior to the motor nucleus of the occluomotor nerve and at the level of the inferior colliculus. The axons of the fourth cranial nerve leave the nucleus and actually decussates in the superior medullary velum. This is the only cranial nerve to decussate prior to exiting the brainstem. The significance is obvious that the right superior oblique muscle is controlled by neuronal cell bodies in the left midbrain. The trochlear nerve exits dorsally from the midbrain. Again, this is unique amongst cranial nerves. It travels along the medial, free edge of the tentorium cerebelli through which the brainstem is passing. It pierces the dura just posterior to the posterior clinoid process and enters the cavernous sinus where runs just medial and posterior to the occulomotor nerve before entering the orbit through the superior orbital fissure. Since the superior oblique muscle acts to rotate the eye down and laterally a palsy of the trochlear nerve leaves the affected eye rotated up and in. 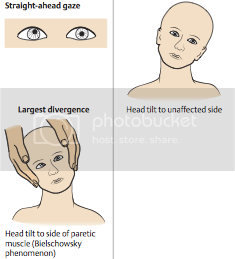 Attempts to compensate lead to the patient tilting their head to the contralateral side. Amongst cranial nerve palsies a trochlear injury is the second most common manifestation of raised intracranial pressure, only the abducens more likely. It is the longest nerve and the smallest in diameter and particularly prone to the effects of raised ICP due to its lengthy free course starting dorsally and then extending through the anterior cisterns. Compressive injuries can also occur uniquely with posterior cerebral artery as early in its course the trochlear passes between the superior cerebellar and posterior cerebral arteries. Obviously pathology in the cavernous sinus can affect the trochlear, as it can the occulomotor or abducens or the first branch of the trigeminal. A more unique consideration for the neurosurgeon is the trochlears path along the medial edge of the tentorium. Transtentorial surgical approaches to the lower brainstem or the proximal cranial nerves located there, must be careful when incising the tentorium not to incur sharp damage to the trochlear or to overstretch it with retraction. 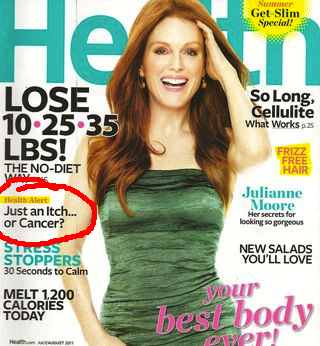 Thanks to Lauren for pointing out errors on the page. The New York Time has a profile of a gentleman, illegally in the country, who spent 19 months in a New York City hospital because there was no funding for the out of hospital assisted care he was going to need. [T]he hospital admitted Mr. Fok to the intensive-care unit on the third floor, where workers tried to find out more about their patient — not just his medical history, but his insurance or Medicaid status, his address, his Social Security or taxpayer identification number, the location of family members. Nineteen months later, Mr. Fok, 58, greeted a reporter from his bed in Room 516, eager to have a visitor. In the previous year and a half, perhaps 100 or more patients had come and gone from the room’s other bed, but Mr. Fok had gone nowhere. Near the border here in Texas this is not an unusual problem. Plenty of illegal immigrants with serious, emergent problems are seen at my primary teaching facility. Many a times they end up in conditions necessitating long term care. With no funding, with no public non-acute health care system in Mexico there really are no options but to keep them in the hospital until charity funding is identified for them. To be fair the profile goes over the active measures the patient, Mr. Fok, took to impede his placement and his care. Many times the patients I encounter have family and friends who will actively work to help in trying to get the patient to a better place outside the hospital, but with limited resources and unable to provide the care he needs themselves it proves difficult. A new study in JAMA looks at regional variations in how ‘living wills’ effect care. It appears that where care is aggressive to begin with making your desires known in a living will can limit that aggressiveness but where patients are already traditionally led towards comfort and less aggressive care the living wills have less effect on practice. It may be that putting limits on treatment “requires an explicit statement” from patients in areas where the default is to treat aggressively, the researchers wrote, but less so when the local culture already prefers palliative care. Some data in the study indicated that advance care directives limit treatment in ways not envisioned when these were first introduced. Initially, their purpose was to prevent mechanical ventilation or tube feeding in patients who indicated beforehand that they did not want such artificial life-prolonging measures. Nicholas and colleagues found that even when directives reduced the quantity of care given, they did little to discourage specific interventions such as intubation and ventilation. What appears to be happening, the researchers argued, is that these interventions may be withdrawn faster when patients have left directives. I feel like I have a lot of exposure to end of life issues. I would say the above is some of what I see. Rarely does a living will prevent emergency intubation and ventilation. This is largely because sometimes the issue of potential wishes is unable to be addressed during an emergency. Another is that even when the issue is breached families, even in the presence of a living will, choose initially, in an often pressed decision, to err on the side of intervention. Then they can always make a decision in the coming days or weeks about what their loved one would really want and move towards comfort care at a later date. And so I agree in my experience a ‘living will’ is something that can be a comfort and encouraging to family making decisions for a loved one; reminding them exactly what the patient would have wanted. It leads much more to withdrawal of care and comfort measures more than it prevents aggressive initial care. As more nurses, pharmacists and physical therapists claim this honorific [title doctor], physicians are fighting back. For nurses, getting doctorates can help them land a top administrative job at a hospital, improve their standing at a university and win them more respect from colleagues and patients. But so far, the new degrees have not brought higher fees from insurers for seeing patients or greater authority from states to prescribe medicines. So the debate over scope of practice and titles begins again in The New York Times. We know the lengthy history of the title in Europe; rising with emergence of the post-Medieval university. In the United States however almost exclusively in social and professional spheres it has been used to refer to physicians. Not chiropractors or pharmacists or nurses or physicists or poets or mathematicians or lawyers. When you introduce yourself to a patient, or indeed anyone, as a “doctor” their first question isn’t, “Doctor of what?” or “What type?” There is a norm and understanding that you’re introducing yourself as a physician. And there’s nothing wrong with that norm; it merely is the way it is. [M]any physicians are suspicious and say that once tens of thousands of nurses have doctorates, they will invariably seek more prescribing authority and more money. Otherwise, they ask, what is the point? I see slippery slope and the worry from physicians. “Doctor” has always been an unregulated honorary title. It has become socially acceptable only for use, outside academics, by physicians. To use it otherwise was to draw snickers or scorn. But the rise of a largely independently practicing class of advanced, doctoral degree holding nurse practitioners provides a challenge to the title. Here are practitioners holding advanced degrees, performing many but not all of the same health care delivery that physicians give. There may still be quizzical looks at cocktail parties when the title “doctor” is used but there are bound to be fewer and fewer of such in the clinic as “physician extenders” with professional doctoral degrees take on more and more responsibility. Also I found it via Reddit. The DaVinci surgical robot, used primarily at present in urological surgery, has gotten a lot of media. Here it is showing its stuff by skinning a grape. So I guess it’d be useful in the kitchen as well as the OR. I think there’s a future, as the cost comes down because the benefit appears relatively marginal at present, for robotics in just about all surgical fields in the future. I can certainly see a robot help splitting the fissure or dissecting away an acoustic or the like in neurosurgery.